A regional daily has warned football fans that its revived sports edition could close again if it doesn’t attract more readers. 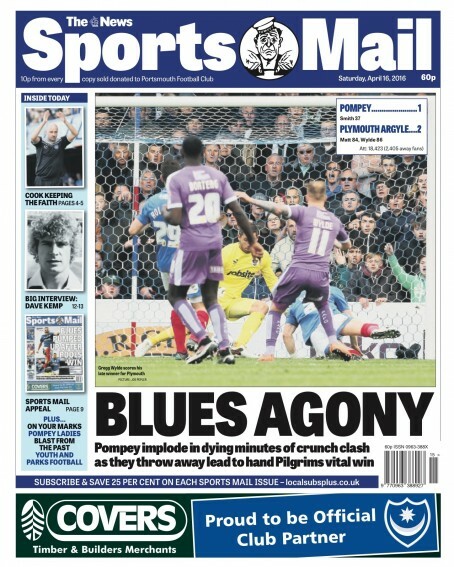 The News, Portsmouth, has issued an appeal for more people to pick up a copy of Sports Mail after revealing the publication is currently averaging less than 3,000 readers every week. Sports Mail was closed down in October 2012 after 109 years, but returned nearly 10 months later after an “outpouring of emotion” from readers. At the time of its scrapping, the paper was averaging 3,700 readers every week, almost 1,000 more than the 2,792 it currently records. An appeal in Saturday’s edition of Sports Mail, pictured above, states the writing “appears to be on the wall” for the publication unless readers rally round again. “Developments in technology and the ability to receive instant information, rather than wait until 5pm to painstakingly study that day’s results have transformed the landscape,” says the piece. “Unless the Sports Mail can pull in more regular readers – the clock is ticking down on one of the remaining two Saturday sports papers in this country. Sports Mail is one of the last two surviving Saturday sports papers in the country, slongside the Southern Daily Echo’s Sports Pink. It averaged around sales of around 5,000 in the weeks following its revival, which coincided with the start of Portsmouth FC’s 2013-14 season. Ten pence from every copy of each week’s edition, priced at 60p, is donated to the club, which has suffered financial problems in recent years. It’s a shame but it won’t happen. The days have gone for this sort of publication, though I loved them as a kid and younger man. But then I probably did mammoths too, come to think of it. Maybe the editor needs to figure ways of pulling people in with exclusive content and some innovative features, perhaps, and give people a reason to buy. Just expecting fans to snap up a publication because otherwise it’s going to be pulled isn’t quite the right approach. Look at the whole package: where is it sold? Is it convenient for fans to get hold of when they leave the stadium? Are there any pubs where football fans tend to go – could it be sold there? Yes, habits have changed and yes there are ways of getting content immediately so why are newspapers still primarily sold in newsagents and supermarkets? Even street vendors have been axed. In many ways the demise of the Saturday night football paper was simply a precursor of the deeper malaise that is haunting the industry. Changing habits, the availability of easier to access alternatives – all the usual suspects are lurking in the wings. Personally I am amazed that the Portsmouth sports paper has survived so long. There are far too few die-hard fans out there who are prepared to seek out such a newspaper on a Saturday evening, ever to make such a venture viable. It’s a great pity, but my they were fun to work on while they lasted. Football’s changed, reading habits have changed. You get goal updates on your mobile, and reaction on the website within seconds of the final whistle. Sorry guys, but the beast is taking its final breaths. I used to love our local Green un’ but at the end of the day it’s up to the newspaper groups to put out a product that people want to buy, not one that they are going to purchase out of sympathy. Its a long time since we picked up ( along with a bag of chips) a report of a match on our way home , with reporters sub editors and printers doing a fantastic job against incredible deadlines. No-one really wants blow by blow accounts nowadays of top games- all the important stuff is online or on TV. This was a good try and should not be knocked, but it was tough call from word go. Couldn’t reduced coverage have had something to do with the drop in sales? Portsmouth NUJ branch members were told at their last meeting that The News had asked sports correspondents to submit copy free of charge instead of being paid for their efforts. Some, at least, decided that it was one offer they could refuse. It`s sad to lose a traditional paper but this must be one of the last surviving of its type,i used to eagerly queue up right afterr full time at the local newsagents to buy my copy oif the late football final but that was 30+ years ago and the those days are long gone. fottball results,news and analysys is available on (the dreaded) iphone,tablet or pc as it happens often with live minute by minute updates,video and feature pieces making a late sports special such as this pretty much obsolete. if they turn it to a digital only publication via an enhanced website they may be able to attract both a new readership base and advertisers looking to reach a targetted audience sector whilst saving considerable costs in newsprint and production. Always enjoyed reading Ireland’s Saturday Night in Northern Ireland which closed a few years ago. A struggle to keep these papers going in the face of all the immediate competition. Fair play to the Mail for telling readers how it is. No point them complaining when the paper is gone if not enough of them support it. bof might be right. With some regionals that once sold 100,000 plus A DAY now struggling to sell 12,000 a day it must only be a matter of time when they become weeklies, which. sadly, is all a lot of them look like anyway despite the Herculean efforts of the few staff. I can’t exactly remember when the South Wales Echo stopped doing their ‘pink’ but I grieved and understood when it happened. Being a valleys boy I never once left Cardiff without my copy until the day it died. Sadly, even then I already had everything on my “not-so-smart” phone. We all pity the demise of printed papers, and many of us have reasonable suggestions that could at least prolong the seemingly inevitable, but the evening sports paper on a Saturday was doomed to fail as its USP was almost immediate updates after the game. Slightly off tangent, but the quality of writing and editing on weekly paper sports pages needs to be drastically improved. Too much free sent-in copy goes in unedited, and it is truly awful stuff. Bit more pride needed in the publication boys and girls. Whistleblower has a point. The standard of sports editing and grammar on my own local JP weekly makes me squirm! It is all to do with not having proper sports editors or subs I am afraid but we can’t turn the clock back to kick off just because we scored an own goal.